Right, before jumping into the code, we need to get the theory sorted in our heads. It's a relatively simple system once you grasp the concept. To make this system work, we first need to know 3 things; the window width, the width of the blocks and the margin between these blocks. From this data, we then calculate the number of possibly blocks that would fit in the window. This gives us our number of columns, so in the diagram above, it would be 4. So we create an array with 4 values in, defaulted at the value of the margin. This array is used to store the running heights of each column. E.g. 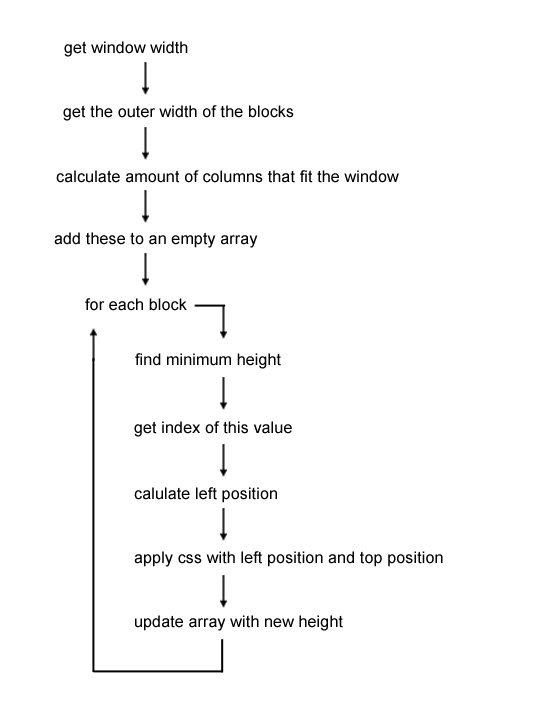 a block of height 120px is added to column 3, so that value in the array is increased by 120. We also use the index number of each value to calculate the position from the left of the screen. Here's a flow diagram of how the function will work. This will also run everytime the window is resized so the blocks can update themselves. So there's some information about the theory behind both Pinterest and jQuery Isotope. If it didn't make much sense then hopefully getting stuck into some code will help. To start, we need a simple HTML structure. From this HTML, we need to grab 3 vital values; the window width, the width of the blocks and the margin between the blocks. We start by setting some global variables, along with our empty array we'll be using to store the heights of each column. Then, when create our function 'setupBlocks'. This does as it says and sets the blocks up correctly for positioning. Note: We use onload on the body tag to call our setup function. In the setup, we grab the width of the window, along with the width of the blocks. 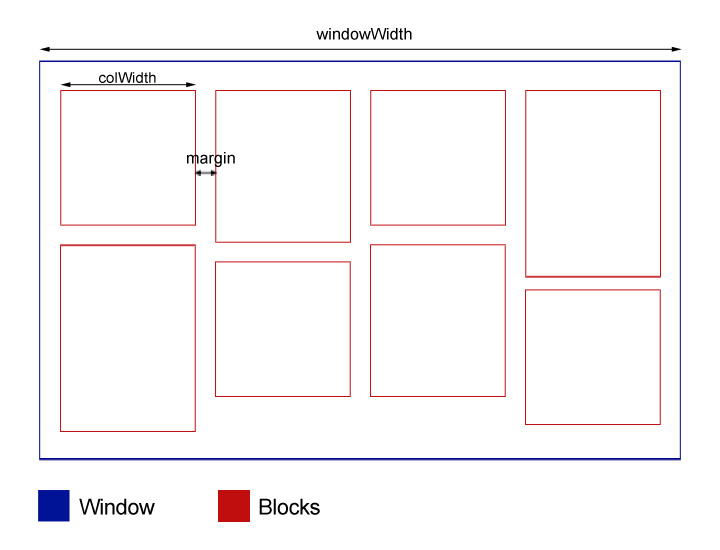 We set the window with as 'windowWidth' and the blocks width as 'colWidth'. The next line calculates the number of columns that will fit in current window. Here we add the margin to the width of each column and then divide the window width by this number. Finally, the number is rounded down to give us a whole integer. We create a loop which creates values for each column. So if there are 4 possible columns that could fit in the window, there will be 4 values in the array. Did you notice what was happening? When the window was smaller, there were less number of values in the array. This is because there were less columns that would fit into the window. Let's break this function down. Firstly we definite the function with the name positionBlocks. We then loop through each element on the page with the class 'block'. Two variables are then set. The first is 'min', which represents the lowest value in the array, which is also the column with the lowest height. The next is index which represents the index number of this value, along with the column number we need to place the next block in. E.g. our array looks like this [20, 95, 75]. The lowest number is 20, so min=20 and index=0. We can then calculate the position from the left of the screen based on these numbers. To calculate the left position, we add the width of each column to the margin, multiple that by our index and finally add another margin. This additional margin acts as a padding on the left of the window. The new leftPos value and min is applied to that block. The last line is simply updating the array with the new height. This height is calculated by adding the current height, to the height of the current block and the margin. The function at the end is used to get the minimum value from the array. You can read more about it here John Resig. We finally need to call the function 'positionBlocks' to the end of the 'setupBlocks' function so it runs. This will animate the blocks both on load, and when the window is resized. I hope this has been some help to you. I really enjoyed building this solution and working with the maths behind the scenes. Feel free to comment if this makes no sense or you're having problems with the code.